Emperor penguins are the largest of the 17 species, or kinds, of penguins, and they spend their entire lives on the cold Antarctic ice and in its waters. They survive—breeding, raising young, and eating—by relying on a number of clever adaptations. Emperors clump together in huge, huddled masses. They take turns moving to the inside of the group, where they’re protected from the icy cold temperatures and wind. Once they’ve had a chance to warm up, they take their turns back on the circle’s edges, giving fellow penguins time in the warmer center. Winter arrives in Antarctica in March. The continent is in the Southern Hemisphere and has seasons that are opposite those in the north. Nearly all creatures leave except for the emperor, the only animal that spends the winter on Antarctica’s open ice. These flightless birds breed in the winter (unlike most birds, which breed in the springtime). After a courtship of several weeks, a female emperor penguin lays one single egg then leaves! Female emperors take off toward the open sea to feed, traveling up to 50 miles (80 kilometers) across the frozen surface. Where does that leave the eggs? At the feet, literally, of the male emperors. Each penguin egg’s father balances it on his feet and covers it with his brood pouch, a very warm layer of feathered skin designed to keep the egg cozy. There the males stand, for about 65 days, through icy temperatures, cruel winds, and blinding storms. And they eat nothing that whole time. Finally, after about two months, the females return from the sea, bringing food they regurgitate, or bring up, to feed the now hatched chicks. The males eagerly leave for their own fishing session at sea, and the mothers take over care of the chicks for a while. The youngsters stay sheltered in their mother’s brood pouch for two months. If a young chick falls out of that warm spot, it can freeze to death in as little as two minutes. 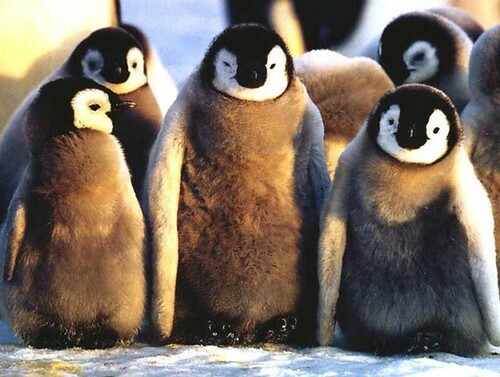 As the young penguins grow, adults leave them in groups of chicks called crèches while they leave to fish. They return with food they regurgitate for their young. 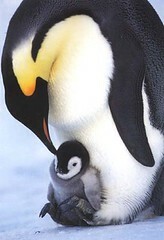 There is a reason for the timing of emperor penguins’ hatching. By December, when the Antarctic weather has warmed somewhat, the ice the penguins occupy begins to break up, bringing open waters closer to the nesting sites. Now the chicks are at the age of independence—old enough to take to the seas and fish for their own food. Amazing info, animal world never ceases to surprise me. Baher: I also found that amazing. my talk here bcoz i like the pictures,but i have noticed that you said " typical IT guy ",let me tell you if you look at it for your way its right but if you look of it as your seeing a man with a nice tuxedo then you can find that the penguin is the best. 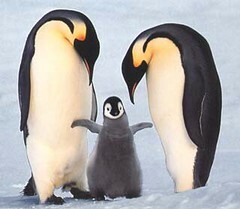 do u know why Linux related to tux or penguin?bcoz he bet the Linux kernel creator Linus. Linux: Thanks for the info and for sharing the pics, they were really funny, especially the clock! I really first thought I was going to see babies or something :P I perconally love pernguins just because they're penguins!